Neil Diamond has released “The Ballad Of Saving Silverman,” a previously unreleased track from the upcoming Neil Diamond 50th Anniversary Collector’s Edition, for streaming and immediate download with the digital-album pre-orders. The song is from the 2001 cult comedy Saving Silverman that Diamond has kept in his vault since writing it for the film. The film is about fervent Diamond fans who try to keep their buddy from marrying the wrong woman in which Diamond appears as himself. However, the singer/songwriter has never let on that he had written the perfect theme to the movie. The catchy tune sums up the film and even includes a spoken-word bridge. 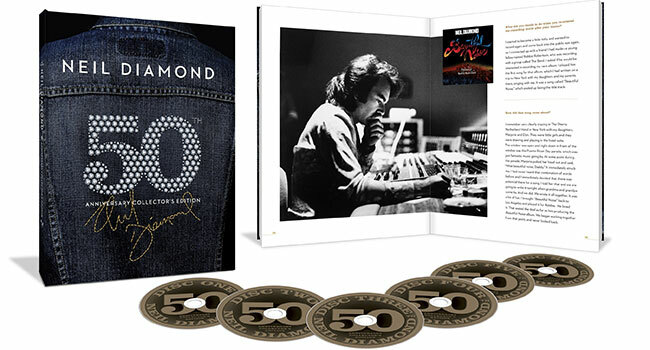 The Neil Diamond 50th Anniversary Collector’s Edition is a 6 CD retrospective that spans the singer-songwriter’s entire storied career. The fully loaded collection contains 115 tracks overall set in a hard-cover book, featuring scores of Diamond’s most beloved hits alongside demos, rarities and 15 previously unreleased tracks.